One lucky member will receive a signed copy of Liz's new novel. To enter the competition you must email editor@putneysw15.com by noon on May 8th 2013 with your contact telephone number and your answer. Mark your email as Cowley competition. Q: What is the title of Liz's debut novel? ‘And Guess Who He Was With?’ is a girl’s best friend, guaranteed to make you laugh and cry and always say the right thing. 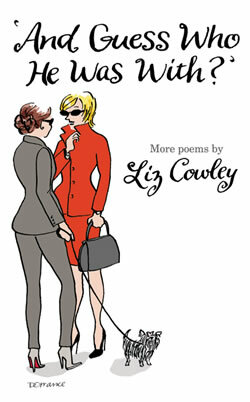 In this collection, her third book of humorous poems, Liz looks at the roller-coaster journey of women’s lives – and the lovers and liars, friends and enemies, joys and disappointments, frustrations and betrayals along the way. Wry, bittersweet, often hilarious and with a characteristic sting in the tail, Liz brings a unique and often wicked wit to the pitfalls, perils and pleasures of love in a heady mix of laughter and tears. Liz has had a long career as an advertising copywriter, mostly writing on women’s products – ‘a terrific opportunity to listen to women talk about their lives’. She has written poetry for many years, but only recently considered publication. Liz has lived in Putney for 23 years, having moved from Richmond, and is currently completing a fourth book in tandem with copywriting assignments — about gardens and gardening — another lifelong pleasure.
" For a special meal out, I love Emile’s restaurant on Felsham Road – Emile is lovely and so is the food. Other favourites include Samratt for Indian (Lacey Road), Talad Thai (Upper Richmond Road), and Royal China in Chelverton Road, La Mancha in the High Street for tapas after the cinema, and Carluccio’s on the river for lunch al fresco." "Favourite drinking spots include The Telegraph on Putney Hill, and the nearest locals, The Coat and Badge and the Jolly Gardeners in Lacey Road." "But my absolute favourite eating and drinking spot is my own garden – weather permitting!! Her first book, A Red Dress, came out in 2008, took the top spot on Amazon, and was turned into a stage show in Dublin. What am I doing here? followed in 2010, and a selection from both books was featured as the finale of the West Cork Literary Festival the same year, starring the acclaimed Irish actress Cyrena Hayes Byrne. Her Irish grandfather, a vicar, came from Connemara and she is married to Irish author, Donough O'Brien, with a daughter and two stepsons.